3 Things You Need To Know About Covert Spy Cameras | Calgary Alarm Inc.
Covert spy cameras, also known as covert cameras or spy cameras, are small cameras that are placed out of sight – they are “hidden” cameras. While they are widely in use and offer many benefits, which we will get to below, here are three things you may not have known about them and certainly need to. Covert spy cameras have benefits for a wide range of environments, both at home and at the workplace. At home, some of the most popular uses for using a covert spy camera are being able to monitor the nanny or babysitter and keeping tabs on teenagers. It can be used to monitor the housecleaner, or if you have someone coming to watch over your pet. If you have a parent or loved one in a nursing home but are worried about possible mistreatment, you can simply set up a hidden camera in the nursing home. If you own a business, internal theft is very common. If you suspect that your employees are engaging in misconduct, you can legally place a covert spy camera in your place of business and use it to deter employees from theft. Your business is your livelihood and it is important to protect your assets. Covert spy cameras can also be used to monitor the safety of your employees by placing the cameras in parking lots, hallways and stairways. There are different types of covert spy cameras. The one that you choose will ultimately depend on how you plan to use it. One of the most conspicuous cameras is the sprinkle camera, but there is also a camera that looks just like a smoke detector (The Spy Cam), as well as covert spy cameras that have built in motion detectors that record once motion is detected. You then simply watch the video produced by the covert spy camera on your computer or television. 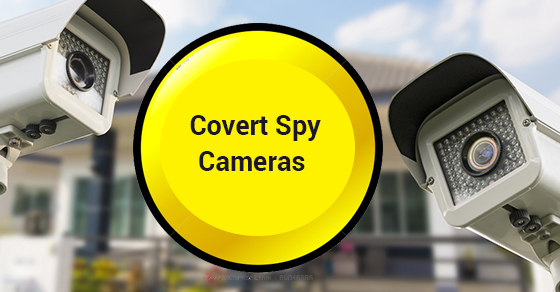 Covert spy cameras can be used in tandem with a variety of other security devices such as video surveillance systems, allowing you to monitor high-risk areas. Covert spy cameras can also be used alongside access control (electronic card access) to increase employee safety even further. As one of the best security alarm monitoring companies in Canada, consider Calgary Alarm for your choice of covert spy cameras. Contact us today for more in.